Can I just say that I am loving where interiors are heading at the moment. 2018 feels softer, still fresh and clean but softened by very natural sages and blush. 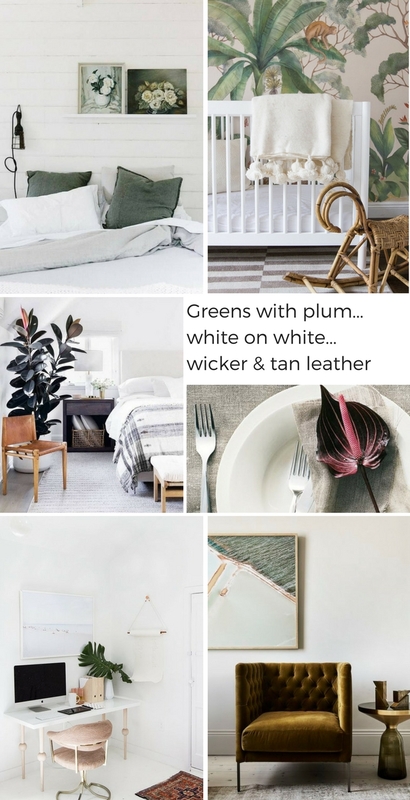 Greens in every colour are in but especially tones of olive and sage, greens muted with greys. Blush is still going strong (I am still smitten) and warming these softer colours up is a curated amount of plum and mustard. Our love affair with brushed brass and bronze continues, pairing beautifully with soft grey or white walls and joinery. Lighter woods also soften these white on white or soft grey interiors, and by light wood I mean pale wood tones lightly limed or washed, not the blonde woods or heavily limed woods of the previous decade. I do think that black hardware in bathrooms will pass. However crisp black steel frames on shower screen and windows are in, these classic industrial frames never really go out of style. Small crisp amounts of black in furnishings and fittings (like windows) are going to keep the soft colour palette sophisticated. 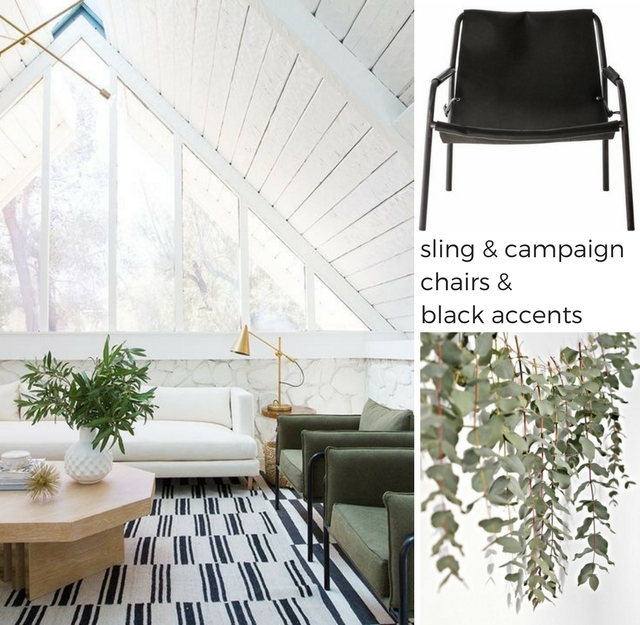 Sling or campaign style chairs are going to be even bigger this year, although leather tones will soften from browns to tan, again a look that never goes out of style. Even kitchens feel a bit softer this year. We are moving away from waterfall panels of stone, instead islands are being dressed with legs in wood or steel making them look more like tables. I wasn't sure about this look but this kitchen by Kyal and Kara has me sold, the wood makes the space look a bit country kitchen but in a modern way. I don't think we will see to many more black kitchens, they are being swapped for grey and sage and of course white is always timeless. There doesn't seem to be any navy in my pics, but of course navy is always classic and will work beautifully with blush, sage and grey. 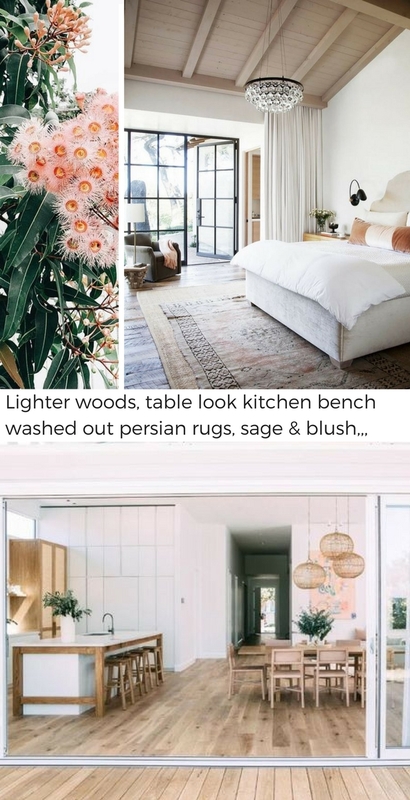 Looking back at the mood boards they appear to be equal parts Australian and Californian, an interesting blend that is sophisticated and warm but quite modern and pared back. All in all it is my favourite year for a while. Soft and washed out by the sun (like my 25 year old kilims) but with grey tones and hints of black keeping it from being to sweet. I love it all and hope to get a chance to put it into a new home soon.